A proper balance between the business objectives of the corporates and their CSR initiatives can create a win-win situation for businesses and society. This theme was reverberated at the ‘CSR for Inclusive Development’ conference, organised by Governance Now in New Delhi. 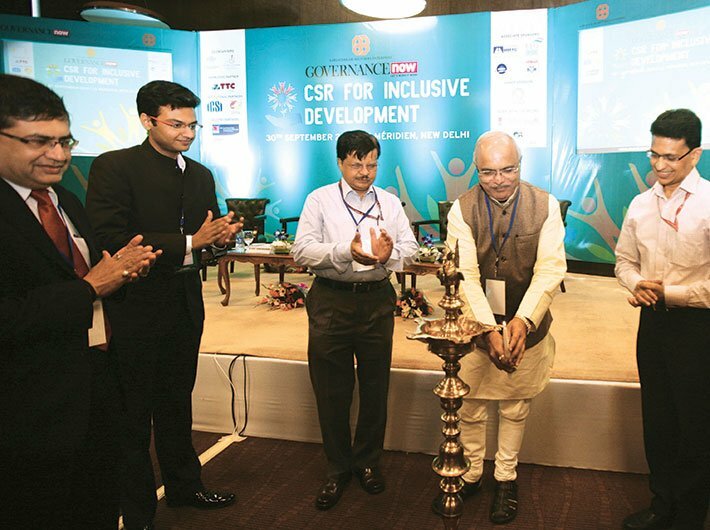 Over 180 decision-makers from various PSUs, and the corporate sector came together to discuss possibilities and pitfalls of the country’s new frontier of the corporate social responsibility (CSR). Highlighting India’s glorious history of philanthropy, he said that it is high time the country moved from inclusive to participatory development. Mukesh Jain, joint secretary, ministry of social justice and empowerment, unveiled the ministry’s upcoming Accessible India Campaign (Sugamya Bharat Abhiyan) wherein the government is planning a slew of measures to make urban infrastructure, transportation, and internet accessible to all, including the disabled. Talking about how India’s 2.68 crore disabled population is excluded from the socio-cultural mainstream, he said, “We have selected 48 cities and asked the state governments to give a list of 100 buildings which can be retrofitted and made accessible to all. “By July 2016, the ministry will make all seven international airports accessible in India. It will also retrofit 4,800 buildings. We are also making 75 A1 level railway stations accessible by this year and 25 percent of the public transport disabled-friendly by July next year,” he added. Urging participation of corporates and NGOs for the campaign, Jain said according to a PwC estimate, every year $4.5 billion or '25,000 crore is expected in form of CSR fund. If this fund is spent in a strategic and non-fragmented manner, one can solve some of the major problems of the country. Agreeing with Jain, DR Sarin, chairman and managing director, Artificial Limbs Manufacturing Corporation of India (ALIMCO) – a public sector undertaking, said that although the government is doing its bit to reach out to the disabled, the problem is gigantic and government funds are not sufficient. He urged his CSR partners to contribute in ALIMCO’s “last-mile connectivity model for the empowerment of disabled citizens”. In a similar vein, Krishan Pal Gurjar, minister of state for social justice and empowerment, urged the corporates to spend CSR fund for the betterment of the disabled. In order to provide a support system for the disabled, Gurjar informed the audience that the government has sanctioned '286 crore for the modernisation of ALIMCO. He said that the government has signed an MoU with German company Ottobock to help ALIMCO manufacture advanced artificial limb and support systems. The government has also decided to provide free cochlear implant to 500 kids and has granted '30 crore for this purpose. Ashishkumar Chauhan, managing director and CEO, BSE Limited, said that of late, funds coming from the corporate sector have helped in taking people out of poverty. He, however, also stressed upon the fact that initially majority of Indian corporates were not inclined towards doing social responsibility activities. “[Even] the Companies Act, 1956, didn’t have any provision for CSR,” he said. Elaborating upon the BSE’s proposed CSR exchange – Sammaan, he said that the exchange will list NGOs, corporates, and projects. “Sammaan will help corporates to access implementation agencies whose credentials have been verified and the agencies to generate funds and enhance their transparency and visibility,” he added. SK Panda, secretary, ministry of textiles, said that corporates should focus on resolving the problems of environment degradation and social exclusion. “Corporates can’t prosper while the society is moving towards failure,” he added. Despite companies spending on CSR initiatives, a lot more still needs to be done. “Every year, '18,000 crore is spent under the CSR provision of the Companies Act. However, not even one percent is being spent by the corporates,” highlighted Gurjar. As a result, it is important to first ascertain the reasons behind the inability of the corporates to spend on the CSR fund. Moderated by Ashok Pavadia, advisor and additional secretary, Inter-State Council (ISC) Secretariat, this session dealt with governance issues related to the CSR and deliberated on the participation, impact, and response of stakeholders. Pavadia said that compliance with laws and spending wisely on right projects are equally important. In order for that to happen, it is important to have a good infrastructure within the company to oversee implementation. Giving a brief outline of how IIFCL contributes to the CSR initiatives, Sanjeev Kaushik, deputy managing director of the company, said that they have roped in IIT Delhi to review possible CSR projects after which funds are sanctioned. IIFCL operated 24 projects in different states across India last year. The mandated CSR budget for 2014-15 was '22 crore, but the company spent '24 crore. For 2015-16, the mandated budget is '24 crore. The company has given '10 crore to the sports ministry to train athletes for the Olympics. However, Kaushik said that the selection of projects needs to be streamlined, which is somewhat random at present. “Many a time, an MP or a government functionary wants something to be done in their constituency. To overcome such challenges, setting up a CSR foundation would be a good idea where a panel would approve projects based on the need (of backward regions),” he said. Agreeing with Kaushik, Ramesh Kumar Sahijwani, VP, marketing and CSR, IIFCO-TOKIO general insurance, and Vivek Prakash, general manager - CSR, Jubilant Life Sciences, said that the pressure from local bureaucrats and politicians is a major challenge. Also, the companies are not adequately resourced to find out if the funds are reaching the targeted pockets. Sutanu Sinha, chief executive and officiating secretary, Institute of Company Secretaries of India, pointed out that family-owned or small companies do not know how to spend the money. “They often inquire whether it would be enough to write a cheque or they have to set up a separate wing for the same,” he said. Talking about corporates and new NGOs, Madhu Sirohi, country head, Vodafone Foundation, said, “We announce open houses through social media where we invite NGOs to be part of the deliberations. Our areas of operations are education, agriculture and inclusivity with focus on women. Technology is the bedrock of everything we undertake, to ensure that development is maximum. “Through social media, the process along with a problem statement is released to see where and how organisations can partner with organisations which are dealing live with these problem statements. That is a standard way of inviting concept notes. The shortlisted organisations are asked for proposal and then there is a due diligence process to select the agency,” she said. Himanshu Shekhar, assistant vice president, Responsible Banking, Yes Bank, said that they have a central CSR team and they make movies on social change, that is, use media as a medium to engage with people and create social change. R Wanchoo, chief general manager and CSR head, NBCC Ltd, said, “Our CSR works are project based. Last year we completed work on 100 school toilets across the country. This year we have done 40 of them. We have certain organisations that cater to NBCC’s associate partners for any activity that is normally tendered. Whatever projects we get from the district administration, they give it to us clearly in writing that they will maintain the project, they will give us the land. PG Deshpande, executive director and head CSR, Rashtriya Chemicals and Fertilisers Limited, said that they have a 49-year-old in-house NGO. “With integrated rural development programme we are trying to develop villages. When we came to urban CSR, we entered into a tie-up with the Tata Institute of Social Sciences and are carrying out various activities,” he said. In this panel discussion moderated by Vijay Chadha, CEO, Bharti Foundation, the panelists discussed various challenges which the stakeholders face while working in collaboration with one another and the possible solutions to overcome the hurdles. Explaining the reason behind friction between corporates and NGOs, Gupta said, “Corporates usually have a notion that NGOs do not work while the latter feel that money is where corporate is, which would help the NGO start its business.” He added that many NGOs which are actually working for the community are not able to market themselves. This is where his organisation, ISRN, steps in – to promote the small NGOs and to break the biased mindset that leads to misunderstanding between corporates and NGOs. The valedictory session saw panellists debating about the Companies Act, 2013, and the role of CSR in the development of the country as well as for a bright future of the companies. Addressing the session, Shitanshu Prasad, executive director and head CSR of Steel Authority of India Ltd (SAIL), said, “Years ago, in the town administration of our steel plants, we had a section called periphery development which was doing nothing but CSR activities. We were making roads and bridges and giving support to the people in and around the plant by running health centres and dispensaries.” The Bokaro steel plant, among others, has started skill development system in ITI, where youth from the displaced families of the expanded land for steel plants are put into skill development in ITI. After that, they are put in one year of apprenticeship in the company, and finally employed. This is a major initiative taken up by SAIL for its CSR activities. However, according to Prasad, one major drawback with CSR is that it has not been implemented properly. The money kept for CSR is not fully utilised because of many reasons. “Last year we had a budget of '78 crore for CSR, but only about '35-36 crore were spent, hence the rest had to be carried forward to the next year. This year, '56 crore is allotted, plus last years’, which comes about to '98 crore. It is very difficult to spend this money now. We should think about another method for implementation of CSR and utilise funds properly,” he said. As a concluding remark, Atul Hasmukhrai Mehta, president of Institute of Company Secretaries of India, spoke about how the Companies Act 2013 has brought about important changes to the Companies Act of 1956. “Life has totally changed after the new Companies Act. With the formation of so many committees like stakeholder relationship committee, CSR and sexual harassment committee, changes are definitely being seen,” he said. The Act has been a good move as now company directors ensure that all the compliances are met, which has increased transparency in the functioning of the company.